These white fluted baking cups offer a sanitary and visually appealing way to display your pastries. They are made of distinctive easy-release paper, making them perfect for automated production facilities, and come packed in a clear sleeve for more convenient and efficient inventory management. 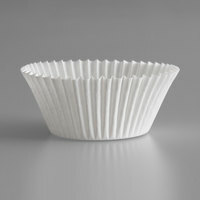 These are amazing white fluted baking cups! Super large order! Great for making daily corn bread muffins to offer to guests instead of warm bread!!! These are great baking cups and buying them in bulk works out perfect for my business. They don\'t peel away from the cupcakes like other liners do and they store easily in the paper sleeves. this baking cup i used most and this place is the best price and good quality. webstaurant supply so fast delivered too! I will continues order from this place over and over again. These are very large cupcake liners. Important to note that these are not grease proof and they do not retain a solid white color when baked with a dark or colored batter. i found these cupcake liners to be too big for a regular cupcake pan and too small for jumbo cupcakes. The price is very reasonable and great value and the product is great quality. it was just not the right size for my needs. I love making muffins in this jumbo cup ....look at my muffins! The paper has the nice thickness ..good quality and hold the batter well.... I used to buy some baking cup from supermarket, it is from a very well known brand but it has really bad chemical smell to it........this one from webrestaurantstore.com NOT have any smell! Love the muffin papers. We use them in a Chicago Muffin pan that makes 24 jumbo muffins. Never had to spray anything. They pop right out. They are very basic and not decorative at all. So, if you're going for pizzazz....try something else. But for basic muffin papers, these are perfect. I find it cumbersome to butter/oil muffin pans so used to use silicone muffin pans but muffins didn't brown properly in that way. I had to figure out the alternative to buttering pans and these cups do the job. Economical and doesn't leave greasy feel. Really great baking cups. Large enough to bake jumbo cupcakes/muffins. They stay white and dont really stick (i spray mine anyway) they are thicker than normal and sturdy. Not only used for cupcakes, but you can use these for other dessert and dinner plates. I use them to make a calzone cupcakes and mini cheesecakes. I love this jumbo baking cup. It fits perfectly inside the the two pack plastic case i purchased previously. In case you need a comboniation pack for muffins or cupcakes, use the Douglas Stephens plasticase b100c. They fit together so well. one pack of 500 liners and one box of 250 cases. You cant go wrong. These are perfect for lining my jumbo muffin pans. It is nice to be able to offer my clients slightly larger than normal muffins and cupcakes. These cups are more narrow than what I\'m used to! However they did they\'re job. I didn\'t have to double the liners this time so they are pretty sturdy as well. These perfectly sized cupcake liners (normal-sized, 3" diameter) are a great deal! They are quite efficient and keep my cupcake ingredients in tact! I will not purchase this product anywhere else but from the Webstaurant Store! Standard cup, great for muffins, cupcakes and holding nibbles [candy or nuts]. These are nothing special, but do the job as intended at a very good price. Will reorder when needed. This item has worked out great for me. It stands up better than some of the other brands I have tried and holds more cake batter. very Happy! These cupcake liners are the prefect size for my muffin tins. I like the way they are shipped and so easy to remove from the packaging when only need a few. Large cupcakes require a very sturdy cupcake liner to hold upto it's size. These liners are perfect for my jumbo cupcakes or muffins and the customers love them too! These baking cups are a great size. They are a little deeper than you find in the store which I like for my cupcakes. As a baker I always want my product to be set apart from what people can buy locally. This is slightly larger than a standard cupcake cup paper and taller. I use them for my cupcakes that puff up when baking and give me good height. Great size for that. Performance is just like a Wilton white baking cup at a 1/10th the price. These paper cups have always been easy to separate, hold up well and release as easily as any other paper cupcake or muffin cup. I use this size and bake the product in king-size tins. Love these liners and will continue to order them routinely. Allows the cakes to rise to a perfect height without going over the pan. Leaves plenty of room for my icing and any decorative toppings. Liners remove easily from the cupcakes. We use these big baking cups for everything - muffins, cupcakes, pieces of baklava, brownies, anything you can think of. They make things so much neater, and I'm not wasting plates. We use these for all of our cupcakes and muffins. They are a perfect size and are made well. We have also tried the more expensive version, but found that we like this one better. These baking cups are great for making muffins and cupcakes. They are a little larger than the traditional muffin cups found at grocery stores. They are very economically priced. I recommend these to home bakers who are trying to save some money! The size of the liners are perfect, the make a nice size cupcake without the batter rising over the top of the liner. Thanks for such a great produt! Great quality item. This is a great way to buy these bulk for your bakery or cafe. These can be use for holding baked food or for baking in. Like the baking cup size. Although the size (for me) is sort of in between standard and jumbo sizes, I could still make an impressive sized cupcake. These baking cups are great quality. You can use them to make jumbo sized cupcakes. They do fit in the standard cupcake pan, But i would recommend to use them with a jumbo pan. I plan on getting the smaller size. These fluted baking cups are classic white, and come in a huge case. They are divided up into smaller packages so you don't have to take out too many at a time. They fit perfectly into a cupcake pan so you can easily remove from the pan when things are done baking. These cupcake liners are the ideal size for my small business needs. I love that they yield a larger-than-average cake, but not quite jumbo-size so I am still able to use a standard size cupcake pan. I also love that the liners never stick to each other, or the pan. Perfect all around! These are actually larger than your standard cupcake liner, so you’ll want to take full advantage and use them in your Texas sized tins (although, they’ll still work in a standard tin). These are perfect for your jumbo muffins, but I only use them with light colored batters because darker batter colors will show through. This jumbo baking/muffin/cupcake cup is great. The white color is classic and of course will never bleed into the baked goodies. These liners release from the pan easily. Part of our nonprofit mission is working with special needs adults and we date code thousands of these cupcake liners. They hold up very well and even though our cupcakes are square, these papers fit well in our baking pans and they don't pull away from the finished baked product. The one suggestion we would make is that they come in a box rather than in a plastic sleeve, like the reynolds cupcake liners are supplied. These fluted baking cups are the only one's i use for my baking business. They are bigger than the cups from the grocery store an give my muffins and cupcakes a very professional look. Very good and make my cupcake look bigger than standard/normal size. More room for me to decoration also. I love it. Thank so much for this product at great price. These are larger than standard, but smaller than jumbo - it will give you a nice, generous cupcake but it's a little large for my purposes - uses too much batter. This are not as large as some of the large baking cups but they definitely get the job done. They do not fold over when they are filled so you get a nicely round cupcake every time. They also make a nice display. not a normal size cupcake. It was double the size but it was perfect. This will be the new size cupcake I will offer because of the perfect size. these baking cups are perfect--unlike the ones you buy at the store--they are crisp and make your cupcakes stand up so nice...and they look pretty--nice price too. I did not know if these would work for oversize muffins but they could not be better. They are a little shorter than some baking cups which makes the muffins look very large and full. I use paper baking cups for everything! It ensures you are able to remove your product from the muffin pan every time, and has a built in packaging for your finished product. Great and large baking cups which you can use for your cupcakes or muffins. Great quality and great compact packaging. Perfect price too. Highly recommended.